Private Cabin with deck, indoor plumbing with 3 piece bathroom. Extra child (<19) – ½ price (age 16-18 $130, 8-15 $100) + 5 dz minnows each per week. Extra child (<19) ½ price (age 16-18 $130, 8-15 $100) + 5 dz minnows each / week. 4 or more adults in 2 boats receive a group discount 10% off. 16 ft boat, 20 hp 4 stroke Yamaha motors, flat floor in the bow, swivel seats, landing net, measuring trough, minnow bucket, anchor, cushions, paddles, safety kit, Lowrance GPS fish finder, and up to 22 L (6 gallons) of fuel per day. Safe, Clean & Comfortable. 16 ft boat, 20 hp 4 stroke Yamaha motor, flat floor in the bow, swivel seats, landing net, measuring trough, minnow bucket, anchor, cushions, paddles, safety kit, fish finder, and up to 22 L (6 gallons) of fuel per day. Extra person in boat add – age >19 – $60, age 16-18 – $45, age 8-15 – $40 per day. Using your own boat for two people. Each additional person age >19 – $55, age 16-18 – $40, age 8-15 – $30 per day. Nightly Accommodations are available for work and other activities in the area – Contact us for a rate. Contact Paul to discuss extending, or creating a package to fit your needs. 2019 Fishing Licenses Prices. Purchase before coming to camp. 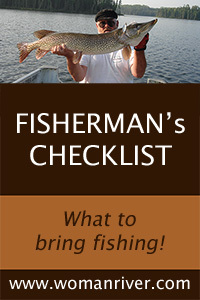 Purchase your fishing licenses before coming to camp. We do not sell fishing licenses in camp. Guide for a day $225 – typical day 8 am-5 pm, includes shorelunch. Trailer Boats $50 each – boat follows guide boat. Maximum 1 trailer boat per guide. The guide will be in the boat you rented with your package. An additional boat or upgrade boat may be used when available. Additional charges will apply. Portable Sonars $10 per day -for use on portage lakes. Shorelunch kits – rent the kit by the day ($10) or the week ($40). Add the fixings per 2 people for $25 per day. Each additional person add $5. Lake Maps – first map is free. Each additional paper map $3.00. Fish Cleaning – $3.00 per Perch or Walleye, $4.00 per Northern Pike. Staff does not clean fish after 8:00 pm. Boat Upgrades $200 – $350 per boat – see Boats for more details. Pre-order flats of night crawlers, leeches by the lbs. and any specialty minnows. Pets – we allow well mannered dogs in camp. $75 per stay. Fish cleaning lessons are always free at Woman River Camp! Due to the high cost of repairs, guests are responsible for all damages to equipment, cabins and property.